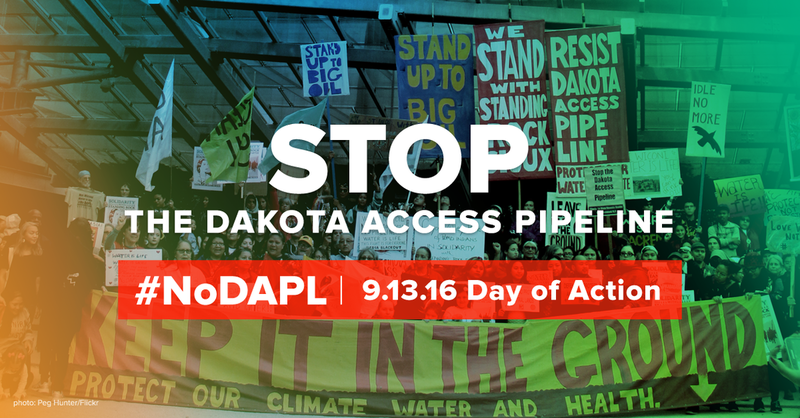 Be part of a national day of action against the Dakota Access Pipeline on Tuesday, September 13! Find an event near you, or sign up to host an action in solidarity with the indigenous communities and local farmers and landowners fighting on the front lines. Right now, we’re witnessing one of the most courageous stands against a fossil fuel project this country has ever seen. The movement to stop the Dakota Access Pipeline is growing stronger by the day, and it’s time for all of us to rise up and play a role in this fight – no matter where we live. For tips and tools on hosting an event -- click here. If built, Dakota Access would carry toxic fracked oil from North Dakota across four states and under the Missouri River, immediately upstream from the Standing Rock Sioux Nation. That makes it a threat to the sacred land and water of Native communities and a disaster for the climate. Thousands of Indigenous activists have set up prayer camps along the pipeline route in a historic moment of nonviolent resistance. They're fighting with everything they have to protect their water, the land, their history, and the climate -- and we need to fight with them. To defeat a pipeline, it takes a movement of people from all corners of the nation. That’s why on Tuesday, September 13, people around the country are taking part in a day of action in solidarity with Standing Rock calling on President Obama to instruct the Army Corps of Engineers to revoke the permits for this dirty oil pipeline. Actions targeting financial institutions funding the pipeline are happening around the country between now and September 17. Learn more here and find an event near you here.